East Grand Middle School students stand around their fruit stand, recently set up at the school. East Grand students are focused on clean eating. 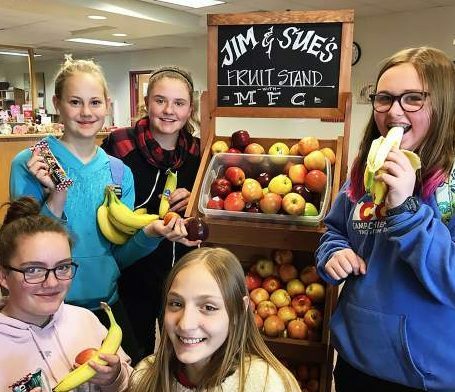 Middle school students recently created a fruit stand after students approached Mountain Family Center with an ambitious idea of building a greenhouse where they could grow fresh produce to have available to students during school. 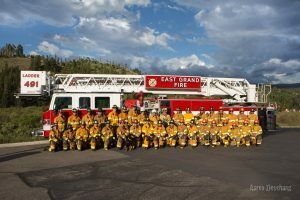 “We loved their enthusiasm and passion for nutritious eating,” said Katie Stuvel of Mountain Family Center. Unfortunately, however, for several reasons, including cost, seasonal factors, labor and more, a full greenhouse wasn’t a viable option. It was after a brainstorming session that the idea for setting up a fruit stand was born and, with a donor on board, the stand was set up in late February. Mountain Family Center purchases the fruit from City Market in Granby using donations for the project. 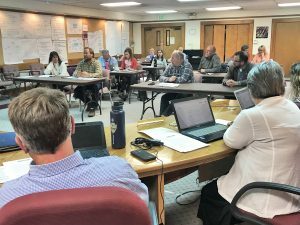 If it continues to go well and more support can be generated, Mountain Family Center said it would like to put a stand inside West Grand schools next year.